Get this limited edition Avon Summer Beauty Set. This set includes a stylish tote that comes fully lined, with interior pocket and magnetic snap closure for only $15.00. Supplies are limited, so hurry up and get yours before they are gone! 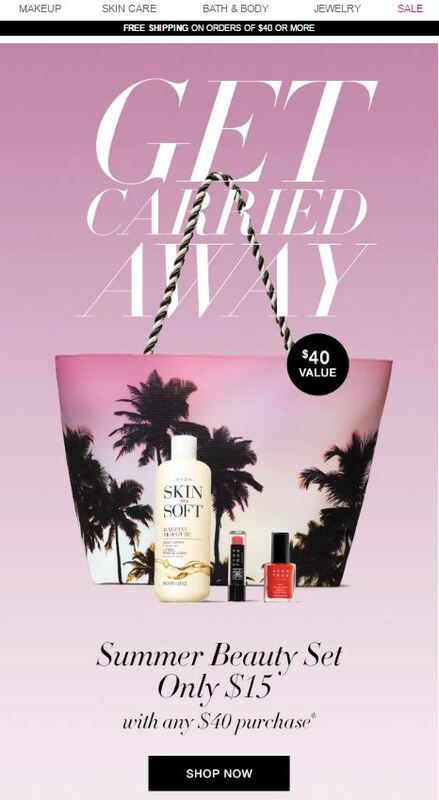 Click Here to begin shopping and claim your Avon Summer Beauty Set today. 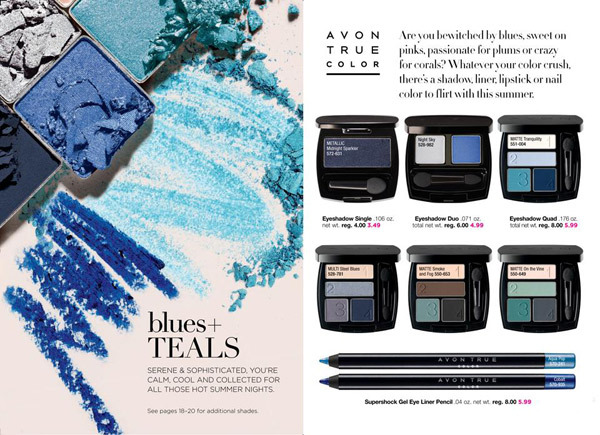 Avon Brochure C17 2017 is here and is bringing us Summer Colors! So what’s in this Summer? Blues, Teals and Smoke. Get Metallic Midnight Sparkler for your eyes (a great evening look) or Night Sky Eyeshadow Duo for the beach. Tranquility Eye Shadow Quad for the everyday look or Matte Smoke and Fog for the Smoky Eye Look. If you prefer something a little more natural looking, Matte “On The Vine” Quad is a great choice. The cool look is in for this summer. And of course, they are all On Sale for only $3.49 to $5.99 depending on your choice. They are regularly $4.00 to $8.00. And don’t forget the Avon True Color SuperShock Gel Eye Liner Pencil ladies, Avon Pop or Cobalt Blue are Now Only $5.99, regularly $8.00. What about the nails and lips? Well, of course it’s Pinks and Berries for summer. 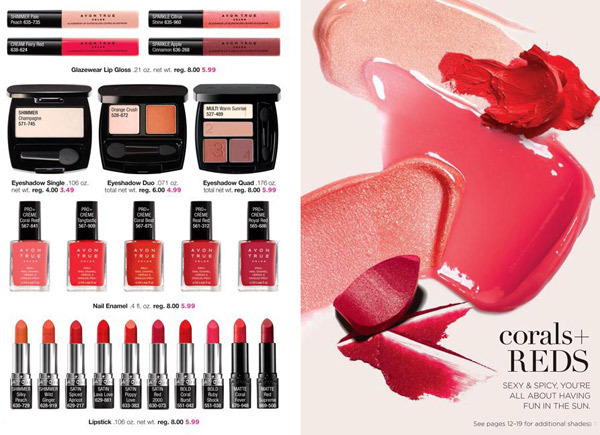 Choose from Lip Gloss, Eyeshadow, Nail Color and or course Lipsticks. All On Sale now in Campaign 17. If you like the wet look for your lips, the Glazewear Lip Gloss is one of our most popular items. Like matte instead, choose one of the lipsticks in the matte collection. Avon True Color Perfectly Matte Lipstick or mark. By Avon Lipclick Matte Full Color Lipstick. If you are looking for the natural look, the Grey Matters or Berry Love are both great choices in the Eye Shadow collection. For those of us who are a warm color selection (you have a slight pink tint to your skin), everything is also available in corals and reds. Be careful with your reds though. Don’t pick a color that’s too dark, it will make you look red if you know what I mean. Before putting on color, you need to take care of the skin first. Our skin is the largest organ in the body. Skin is also very visible. It’s a good idea at any age to start taking care of things. For summer, most women prefer to look glowing. If your winter skin needs a boost, try the Avon Vitamin C Brightening Serum. Avon has come up with a formula to get the vitamin C stable and potent. It gives the skin a brighter, smoother and clearer (more even-toned) appearance. If you need some exfoliation, Avon AHA Refining Cream is a great choice. 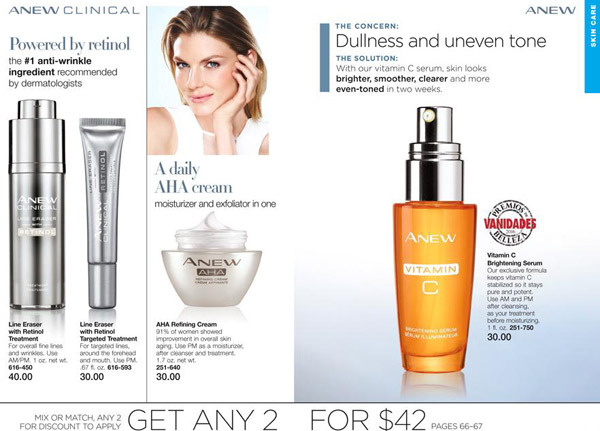 If you have the “W” word (wrinkles), Avon Anew Line Eraser with Retinol Treatment and Anew Clinical Line Eraser with Retinol Targeted Treatment are awesome. It’s one of my customer’s favorites. They both contain retinol which is the #1 anti-wrinkle ingredient recommended by dermatologists. Avon was the first to market with retinol many years ago. And they are all On Sale for any 2 for $42 mix and match. I highly recommend all these products as do my many customers. I haven’t had any complaints regarding these guys. Last but certainly not least, you may want a summer fragrance. 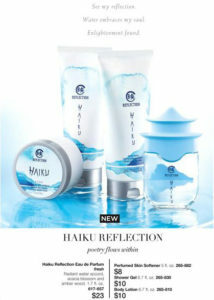 We have a new Haiku, called Haiku Reflection. The scent is radiant water accord, acacia blossom and amber wood. A great choice for summer. If you would like a sample, please Contact Me and provide an address for me to mail it to. Also, sign up for our newsletter using the form on the right side near the top. We only send emails when there is a new blog so you can stay up to date on Avon’s current promotions. I have been ill and I know it’s been awhile since I put up a proper blog, so I hope you enjoyed this one. You can also sign up to comment if you have had an experience with any of the products featured in this blog or if you have a particular product line you wish to know more about. Stay cool, see ya next time. 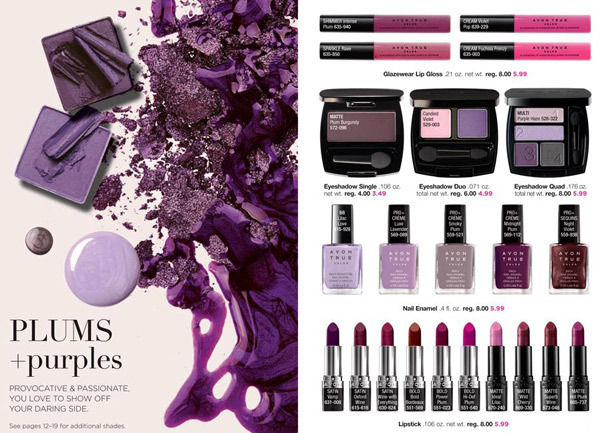 Use Avon Coupon Code FREE25 during checkout to get FREE SHIPPING on your order of $25 or more on the best selection of Avon Beauty Products and Accessories! Click Here to start shopping and SAVING! * Free shipping offer valid for mail delivery order only. To redeem, select standard shipping and enter coupon code: `FREE25`, expires midnight ET, 06/15/2017. Offer does not apply to express shipping methods and is valid only for shipping addresses in the contiguous United States. Alaska and Hawaii addresses are subject to additional surcharges. Please note, Avon does not ship Internationally or to the Islands. UPDATE: Free Shipping Code RA2506 is still valid as of today! 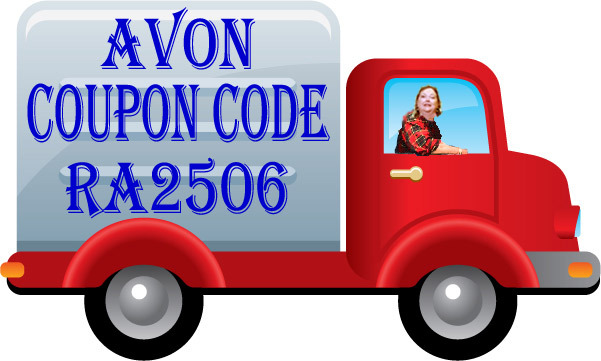 Use Free Shipping Code RA2506 to get FREE SHIPPING on any Avon order over $25.00. This is a limited time offer and is not guaranteed to last. Click Here to go to my eStore and take advantage of this Free Shipping offer. Exclusions Apply. 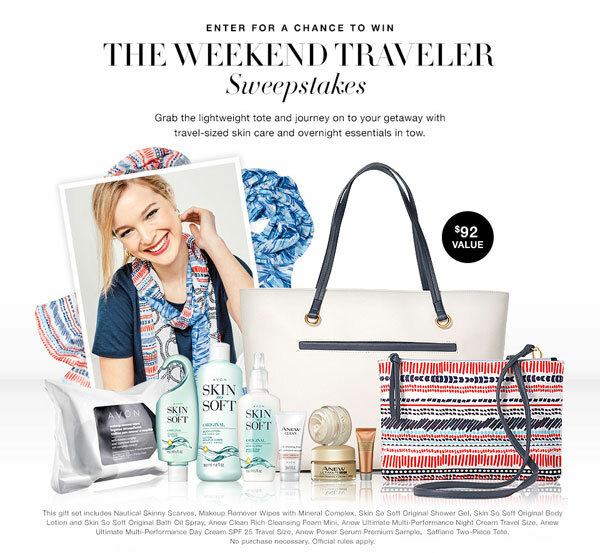 Enter for a chance to win The Weekend Traveler Sweepstakes! This giveaway is valued at $92. Grab the lightweight tote and journey on to your getaway with travel-sized skin care and overnight essentials in tow. This gift set Nautical Skinny Scarves, Makeup Remover Wipes with Mineral Complex, Skin So Soft Original Shower Gel, Skin So Soft Original Body Lotion and Skin So Soft Original Bath Oil Spray, Anew Clean Rich Cleansing Foam Mini, Anew Ultimate Multi-Performance Night Cream Travel Size, Anew Ultimate Multi-Performance Day Cream SPF-25 Travel Size, Anew Power Serum Premium Sample (product shown is full size), Saffiano Two-Piece Tote. No purchase necessary. 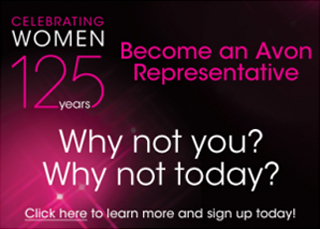 Open to legal residents of the 50 U.S. & DC, including authorized independent Avon sales representatives, 18 or older. Sweepstakes ends 11:59 p.m. ET 7/5/17. Void where prohibited.